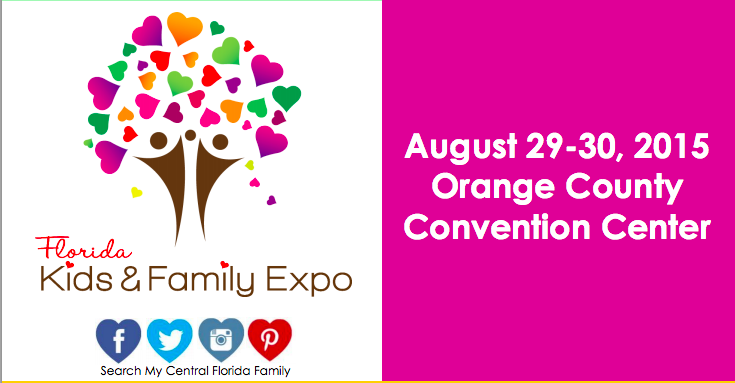 IMC Plan for Florida Kids & Family Expo – Cats, Chocolate + Commas. Disclaimer: This blog post analyzing My Central Florida Family is for educational purposes and my final project for MMC5006: Introduction to Multimedia Communication. My Central Florida Family strives to be the go-to resource for families located in the area by providing them with a comprehensive database of the latest news, upcoming events, school and summer camp information, and businesses. The website was launched in 2014 by three women — Brandi, Jo and Lisa — to make a parent’s or guardian’s job much easier when looking for something to do with the family or various services. In addition to these goals, now the founders are focused on raising awareness for their soon-to-be annual Florida Kids and Family Expo. Throughout this paper, MyCFF will be used interchangeably for My Central Florida Family and FKFE will be used for the Florida Kids and Family Expo. The expo will take place in Orlando’s Orange County Convention Center on Saturday, August 29 from 10 a.m. to 5 p.m. and Sunday, August 30 from 11 a.m. to 5 p.m. It promises attendees “approximately 150 kid and family friendly companies with ideas, savings, fun and entertainment waiting for you and your family” (My Central Florida Family). The event is meant to be informative for parents as well as a “fun and interactive experience for the kids … (who) can come out and really have fun and make some memories” (B. Zrallack, Adobe Connect, March 17, 2015). Some of the exhibits include a mommy massage and pampering station, dad pampering zone, art area, fashion shows and live animal station. So far, as of Friday, April 3, the event’s Facebook page has 117 guests going. Yet it is confusing because there seem to be two event pages, one created by Brandi and another by My Central Florida Family (along with two others that created by the Eventful website). The company should consolidate these pages into one. Brandi indicated that the company’s goal is 15,000 attendees over the two days, which hopes to make this an annual — potentially biannual — event. Few people have bought tickets already as the date is a few months out, but ticket sales are anticipated to come in within a month of the expo. There are a number of sponsors such as McDonald’s, Walgreens, Toys“R”Us and Space Walk in addition to media partners WFTV, XL1067, Magic 107.7 and The Mom’s Magazine. A portion of the proceeds will be donated to New Hope for Kids, a nonprofit organization in Central Florida for kids who have lost a parent or loved one. 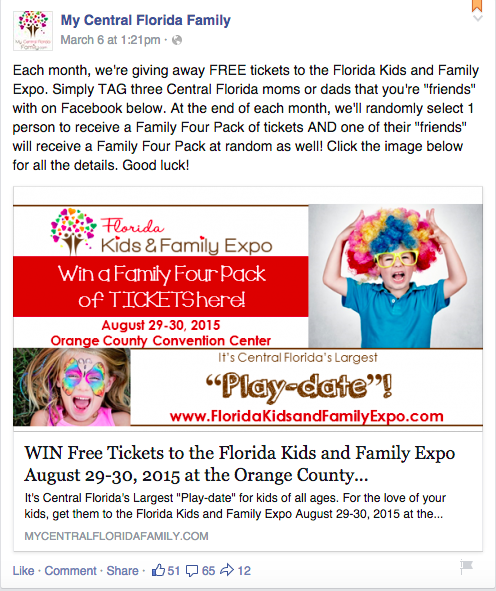 According to Brandi, the Florida Kids and Family Expo’s target audience is “anyone with a family” located in Central Florida (Zrallack, 2015). In sum, females and males in this area who are generally between 35 and 54 years old with young kids. At the expo, there will be things to do for kids of all ages, from newborns up until 17-year-olds. The founders have tried to have activities and bring in vendors for everyone to enjoy. Fifteen percent of MyCFF users are 55 and over; therefore although grandparents aren’t the company’s main audience, they are still consumers. 5. and use of social media, especially Facebook, which is updated several times a day with upcoming events. 3. and the company isn’t doing a lot of marketing yet, but it’s a great time to start sharing more information about the expo. Integrated marketing communication is defined as “a cross-functional process for creating and nourishing profitable relationships with customers and other stakeholders by strategically controlling or influencing all messages sent to these groups and encouraging data-driven, purposeful dialogue with them” (Duncan, 2002, p. 17). In other words, IMC is when a company strategically utilizes multiple platforms to cross-promote content and build meaningful relationships with consumers. It is important for My Central Florida Family to create an integrated marketing communications strategy to spread the word about the event on as many platforms as possible, thus increasing the number of interactions a consumer can have with the company. According to Duncan (2002), it takes seven touches for a consumer to act upon a brand; therefore, being on multiple channels decreases the time it takes for this to happen. For MyCFF, this means promoting the expo on all channels, while maintaining synergy — a cohesive, consistent message. The company can do this on its website, social media and blog, in the email newsletter and using other traditional media such as print and broadcast. 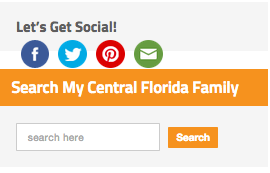 My Central Florida Family has two email newsletters, one for families and one for businesses. This is a great way to specialize content for its audience. The Family Daily Dish Newsletter keeps people updated on events, businesses and other opportunities for Central Florida residents. I signed up for the email, but have only received one so far this week (right). The “daily” is a little misleading; weekly emails at first may be best. 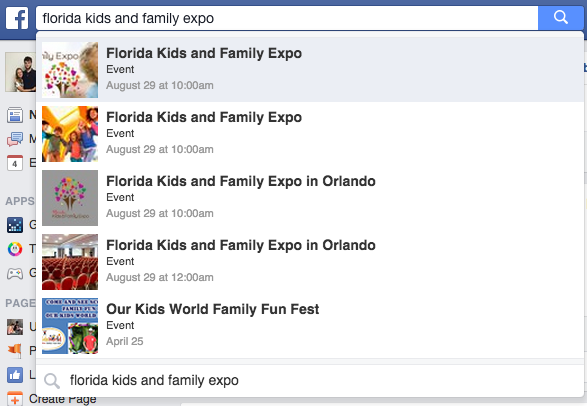 The company should always include information about the Florida Family and Kids Expo as well as links to recent blog posts and other social media (check!). Also on the website, Instagram is not listed as a platform where users can connect with the company (above), but it does have an Instagram account that I found out about in this email. The website should reflect this and this is probably why there are only 90 followers. Email and the Facebook event page are where I would tell attendees to download the app (see next paragraph). Post-event, I would send out a survey through email asking the attendees what they thought about the event, what they enjoyed and what could be improved upon for the following year. This feedback is invaluable because it gives the company insights into what consumers want, if the event met their needs and expectations, and how the expo could be better. Email marketing is incredibly effective and has been shown to produce a big return on investment for companies that Express Pigeon puts it at 4,300% (Jorgensen, 2014). Email marketing has the potential to be more effective than the pay-per-click method, social media, offline marketing, online ads and mobile marketing. For My Central Florida Family, social media may arguably be the best platform to communicate with families, but the Weekly Business Newsletter is undoubtedly the best way to reach businesses. MyCFF should create an app for attendees to use at the expo, which would allow them to view a map of the different exhibits, keep track of which ones they have visited, save information that they learned or from the businesses, and direct attendees to their website and social media. Alerts could be pushed to users when they’re near an exhibit that will be having a special event at a specific time that day, which could be saved to a phone’s calendar. The app would be promoted pre- and during the event. A promotion could also be run with the app the day of, if attendees review an exhibit or the event as a whole, they’ll get a gift certificate or other prize. Although MyCFF’s target audience of parents and guardians might be on social media, I think using print and/or broadcast would help to get the word out to these people along with grandparents about the expo. The company is running ads in local newspapers and magazines — Orlando Weekly, Central Florida Education Guide and Occasions —as well as a spot on the local radio station in the weeks leading up to the event, which would be perfect to catch people, who aren’t plugged in, during their commutes. Many newspapers’ websites also have a list where companies can submit their events to be featured (e.g., Gainesville’s arts and entertainment section called Scene). This would get more eyes on the event for those who like to read the news online. And since this is a local event, I think even posters or other visual materials that could displayed at the cash stands in local stores that parents would shop in like Toys“R”Us are a great way to promote the expo. Looking at MyCFF’s Facebook Insights page, the company would be able to see what posts are (not) working. It seemed that posts with the most interaction had a call to action for users. The company should be posting more of these on both Facebook and Twitter! Brandi said MyCFF would be putting “several thousand dollars into Facebook marketing,” which I believe would help reach more families in Central Florida. Most of the marketing will begin about a month out of the event, but the company should run an ad at least once a month to generate awareness. Once the company grows, I think My Central Florida may need to hire a social media manager. It’s unclear how the work is divided amongst the founders, but there are a ton of platforms to keep track of — email, website and social media— that it is probably overwhelming. The company may already be using some, if not all, of the following tools, but it should be monitoring analytics on these platforms to better understand and serve its audience. To manage email marketing, the company should use a program like MailChimp (free!) or Constant Contact. Rashid (2015) of PCMag tested most of the software out there and came up with an easy to read table showing where programs excelled or fell short. Google Analytics can be used to analyze mycentralfloridafamily.com so the company can see where the audience is coming from, how long users spend on the site and what pages are they visiting. For social media, Hootsuite is a great tool that we came across a lot during our class. This program, along with others of its kind, helps companies manage their various social media accounts, plan posts and measure ROI. Facebook and Twitter also have their own built-in analytics software. Overall, there is much promise for My Central Florida Family and the Florida Kids and Family Expo. The founders are very passionate and providing a great service to the community through the website and soon-to-be annual expo. The company aims to be a one-stop shop for families or guardians looking for things to do with the kids, information on local businesses and services, and the latest news related to Central Florida and kids. Using email, the website, social media and traditional methods, the company is getting the word out about the event in August. I would love to see My Central Florida Family reach its goal of 15,000 attendees for the two days and sell out all booth space. The potential is there for this to be an annual and even biannual event. After this first go around, the company will know how to improve to make the event bigger and better every year. Best of luck!